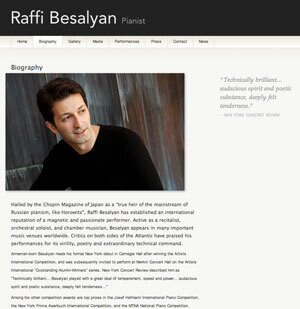 Hailed by the Chopin Magazine of Japan as a �true heir of the mainstream of Russian pianism, like Horowitz�, Raffi Besalyan has established an international reputation of a magnetic and passionate performer. Active as a recitalist, orchestral soloist, and chamber musician, Besalyan appears in many important music venues worldwide. Critics on both sides of the Atlantic have praised his performances for its virility, poetry and extraordinary technical command.